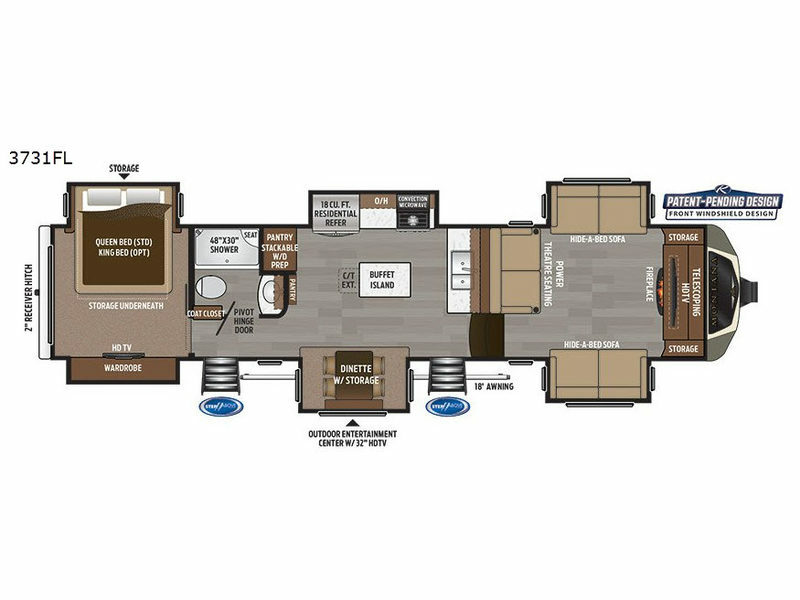 Everyone will surely enjoy all the space provided by six slide outs in this Montana fifth wheel. With dual slides in each area you will find the rooms spacious and inviting. Model 3731FL offers a front living and entertaining room with plenty of seating including dual hide-a-bed sofas and theatre seats with power recliners. Everyone can gather around the HDTV and fireplace to watch movies or the big game. The kitchen offers a separate space to make and eat meals. You will find a buffet island with counter extension, an 18 cu. ft. residential refrigerator, convection microwave, and a pantry, plus more. The bath is across from the second entry into the fifth wheel for easy access in and out when playing outdoors. You will find plenty of storage throughout as well as along the exterior. Outdoors you will also find an entertainment center with 32" HDTV, plus much more!